This entry was posted in Architecture, Exhibitions, Film, History, Holocaust, Journalism, Photography, Politics, Sport, War and tagged 1936, Hitler. Jesse owns, oak saplings, Wiener Library. Bookmark the permalink. Very interesting. You have a broken image link in there, BTW. 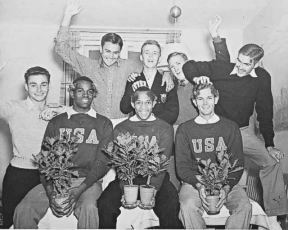 I read a while ago that the whole Jesse Owens thing was about Allied propaganda and that Owens had said that the Nazis, including Hitler, afforded him more respect than he got when he returned to the US (“the President never shook my hand” – paraphrasing). Things not much improved 24 years later when Cassius Clay returned home with his gold medal and famously threw it in the river. I say this not to defend Nazis, of course, just to point out where USA was on race issues until quite recently. I wonder also if there was a lot of guilt in the US that they hadn’t boycotted the games (the campaign for them to do so was quite vocal), so tried to spin Owens’ success as a ‘defeat’ of Nazism and ignored all the other results and the actual final medal table.